Four layers. 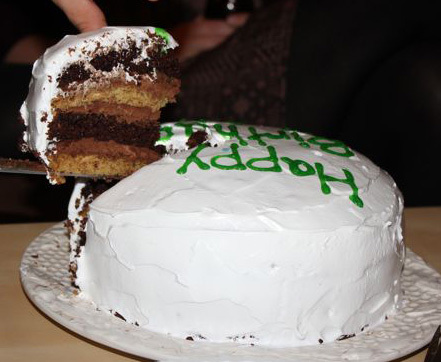 Two kinds of cake. Whipped chocolate ganache. Homemade marshmallow frosting. If that’s not a birthday cake, I don’t know what is. Inspiration for this most glorious creation came to me during yoga (as all my best baking ideas do). LLC requested something s’mores-y for her birthday, and I had an eye to outdo myself (two birthdays ago I made Coffee Butterscotch Awesomeness, and last year were Oreo Cupcakes). So I schemed and plotted and planned and worked the Google like a pro to find the perfect recipe combination. To make this cake I had to be adventurous. Three of the four components I’d never made before, and one (the whipped ganache) I kind of made up as I went. Luckily the birthday baking angels were looking out for me and it all turned out perfectly with minimal stress/drama/anxiety. 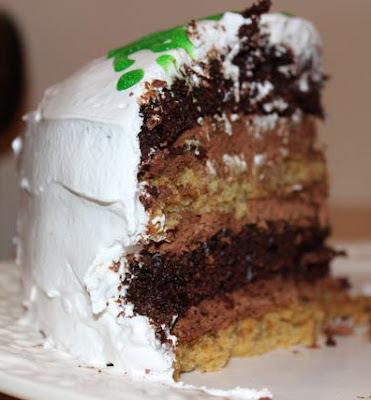 The first cake layer is a Graham Cracker Cake (i.e. 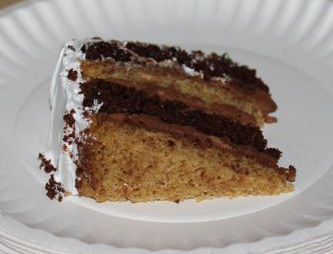 crushed graham crackers in lieu of flour), and the second is a standard Chocolate Cake. For the filling, I thought regular chocolate ganache would be too heavy, so I made ganache then whipped it…essentially creating Chocolate Butter. Swoon. And finally: myself, egg whites, sugar, and a candy thermometer teamed up to attack the final and most intimidating part – Homemade Marshmallow Frosting. It was a match made in birthday-baking heaven. So here’s how it went down: First thing Saturday morning I baked my cakes. I halved this recipe and this one (the quantities below are the ones I used). Then I made the filling, which needs to refrigerate for a couple hours. Then it was marshmallow time. Candy thermometers strike fear in the heart of this daring baker, but I took a deep breath and handled the situation. It was a bit touch-and-go when I had to pour molten sugar into egg whites while beating them. I don’t have a stand mixer, so my left hand was egg-beating, my right pouring a 242 degrees concoction, and the rest of me praying I didn’t do any lasting damage to my person or my kitchen. The cake transported well, and was well-received by the dumpling-stuffed party guests. I’m not sure how much I loved the texture of the graham cracker cake, but when I voiced that as we ate (Me: Hmm, maybe I shouldn’t have done the graham thing…), one guest looked at me, stricken and wide-eyed (Him: NO IT IS PERFECT.) Alrighty then. Preheat oven to 350 degrees F. Spray and flour a 9-inch cake pan. Whisk together graham cracker crumbs, flour, baking powder, baking soda, and 1/4 teaspoon salt in a small bowl until well combined. In a large mixing bowl, beat together butter and granulated sugar with an electric mixer on medium speed until well combined. Beat in eggs until combined. Beat in vanilla. Alternate beating in milk and flour mixture until combined. Bake at 350 degrees F for about 20-25 minutes or until golden brown on top and toothpick comes out clean when inserted into middle. Cool for 10 minutes in the pan, then remove and let cool completely on a cookie rack. Grease and flour one 9-inch cake pan. Add egg, milk, oil and vanilla. Beat on medium speed of mixer 2 minutes. Stir in boiling water (batter will be thin). Pour batter into prepared pan. Bake 30 minutes, or until a toothpick comes out clean when inserted into middle. Cool for 10 minutes in the pan, then remove and let cool completely on a cookie rack. Refrigerate both cakes at least 1 hour. Pour chocolate chips into a large mixing bowl. On the stovetop, stirring occasionally, heat heavy cream until it boils. Let sit for 2 minutes, then stir until smooth. Refrigerate 2 hours, or until completely cool. 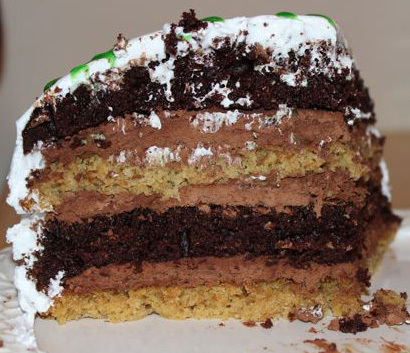 Cut each layer in half lengthwise (to make 4 layers). 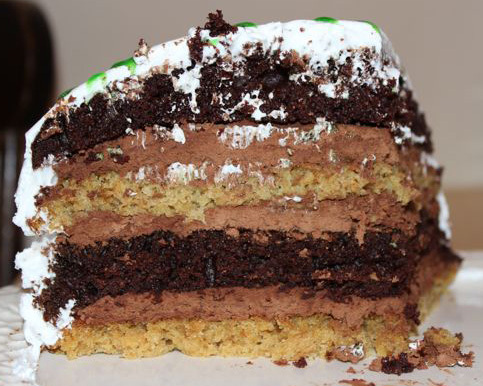 Starting with your flattest layer, spread whipped ganache on it to about ¼ to ½ inch thick. Top with next layer. Repeat until you’re done. Put the sugar, cream of tartar and water in a small saucepan and stir to combine. Bring the mixture to a boil over medium-high heat, cover the pan and boil for 3 minutes. Uncover and allow the syrup to boil until it reaches 242 degrees F on the candy thermometer (soft ball stage). While the syrup is cooking, start beating the egg whites. When the syrup is at about 235 degrees F, begin beating the egg whites on medium speed with the whisk attachment or with a hand mixer. If the whites form firm, shiny peaks before the syrup reaches temperature, reduce the mixer speed to low and keep mixing the whites until the syrup catches up. With the mixer at medium speed, and standing back slightly, carefully pour in the hot syrup, pouring it between the beater(s) and the side of the bowl. Splatters are inevitable—don't try to scrape them into the whites, just carry on. Add the vanilla extract and keep beating the whites at medium speed until they reach room temperature, about 5 minutes. You should have a smooth, shiny, marshmallowy frosting. Although you could keep it in the fridge in a pinch, it's really better to use it right now. I will DEFINITELY be making the Marshmallow Frosting again.